PESHAWAR: Chief Information Commissioner Right to Information Commission Khyber Pakhtunkhwa Azmat Hanif Orakzai has said that 7,076 people have received information from the government departments under the Right to Information Act in the province. “The number of people seeking information under the RTI law to check the performance and transparency of the government departments is increasing as so far 12,859 applications have been submitted in the government departments for receiving information,” the chief information commissioner said this in his presentation to the legal fraternity over the RTI law at a seminar arranged in the Peshawar High Court Bar on Wednesday. About the performance of the commission, he said the commission had received 5,379 complaints against the public bodies, out of which 5,154 were decided. He added that penalties, including Rs25,000 fines, had been imposed on various officials, who had denied giving information to the applicants under the RTI law. Currently, he said, 225 complaints are pending with the commission against the departments. Hanif Orakzai said that every RTI law is being evaluated in a centre called “Law and Democracy” Center at Canada and as per the report of the centre KP RTI Act is one of the top-3 best laws in the world. He said the government had introduced the law to improve governance in the province. “The sole purpose of the law is to ensure transparency and accountability in public bodies through a mechanism whereby citizens could seek information of public importance from public bodies as enshrined in article 19-A of the Constitution of Pakistan,” he added. Under this law, he said every citizen can file an application for information from the public body. The Public Information Officer (PIO) within the department or institution cannot ask the purpose of the information sought. He said some departments and officials had tried to amend the law and bound the applicant that he would first take an undertaken to take the information for a specific purpose and not be used for other purposes, but due to criticism over this effort in the media, Prime Minister Imran Khan refused such an amendment to the RTI Law. However, he said, at the start of the commission there were cases of denial regarding the provision of the information, but now the mindset of bureaucracy is changing through awareness sessions and the commission’s actions and penalties against the violators. 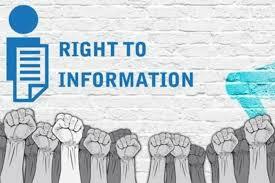 The chief information commissioner, however, said journalists, lawyers and students were on top for receiving information from government departments under the RTI Law. However, he asked the lawyers to read out the act and give valuable suggestions to the commission for further improvement. Mah-e-Talat, Commissioner Right to Information Commission, highlighted various salient features of the RTI Act. She explained the guidelines for submission of application and then complain in the commission in case of denial of the information by the public body. Peshawar High Court Bar Association (PHCBA) General Secretary Yasir Khattak spoke on the occasion. He assured full support to the commission for further improvement.